Years ago I had the misfortune of attending public schools. In high school, we were taught evolution, and only evolution. No Creation Science was discussed, no Intelligent Design, nothing but pagan Darwinianism. Very few students complained or protested, and very few parents at the time homeschooled. So we settled uneasily for evolution without alternative. Today we are blessed to have other options. Christian homeschooling parents can teach their children the Truth, the facts about Creation, with total religious freedom (for now, at least, in the U.S.). But Christian parents beware. It’s becoming increasingly difficult to find Christian homeschool curricula which take a hardline stance against evolution and for the Truth. Which is, I believe, Young Earth Creation (YEC). But does Sonlight hold strongly to the YEC position, as Sarita Holzmann claims that she believes? No! 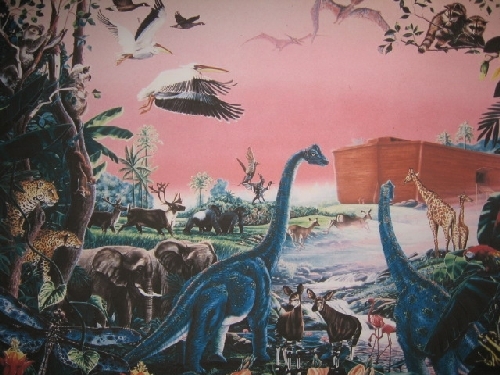 Check out this blog by “Robert”: Do Christian Homeschoolers “Embrace” Evolution? Robert is connected with Sonlight. He never comes out and condemns “Christian” evolutionary theories. And this detailed article by Sonlight co-president John Holzmann (Sarita’s husband) questions whether we can even know that YEC is true. “Obviously, Christians reject non-theistic evolution because by definition that view excludes the supernatural and, with it, God. With a recent grant from BioLogos, Turner and colleague Brian Eisenback, a biology professor, are writing a textbook that discusses the history of the science of origins, as well as different positions scientists have taken on Genesis and origins. They will include material on YEC, evolutionary creationism, intelligent design, and atheistic evolution. Sadly, Sarah Eekhoff Zylstra’s Christianity Today article does not condemn any “Christian” homeschooling publisher for pushing theistic evolution. Besides BioLogos, I hope to locate other “Christian” homeschool publishers which are pushing theistic evolution and other non-YEC theories as the Truth. And mark my word, theistic evolution is an evolutionary theory; it is not Creation. Click here for one of many Christian discernment articles blasting theistic evolution as evolution-in-disguise. Bottom line – It is an honorable thing for Christian homeschool publishers to prepare students for the world’s evolutionary arguments, by warning them about evolutionary theories. (To its credit, the Christianity Today article does mention this practice of warning children.) But beware “Christian” homeschool publishers which cast doubt on YEC and discuss alternatives to YEC, claiming that an evolutionary alternative may be the truth. Henry Morris III, An Inconvenient Truth – This article provides a good introduction to the various views of creation and evolution. Also, Dr. Morris mentions BioLogos.